Top individual was Neil Colcombe (Larford) from peg 56 on the Match Lake. Neil caught short on paste landing 146-14-00. Second on the day was Rich Lawson (Total Angling) from peg 62 on the Match Lake. Rich caught all his fish short and down his edges on pellet landing 135-11-00. 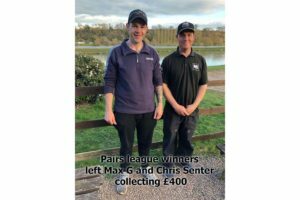 Third placed Chris Senter drew peg 48 on the Match Lake catching carp and F1’s both long and short on pellet to weigh 120-01-00. Fourth overall was Paul Bucknall from peg 4 on the Specimen Lake. Paul fished at 13m with pellet and corn landing big carp to weigh 103-00-00. Fifth placed Simon Harris drew peg 50 on the Match Lake, catching short and down his edge with pellet and corn to weigh 101-04-00.